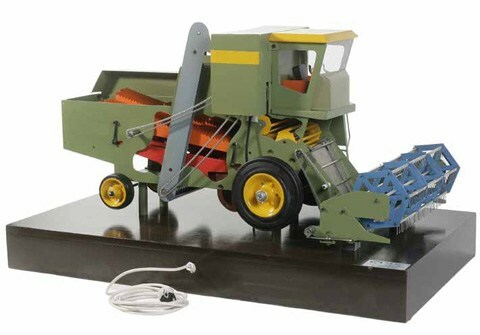 This is a model of a wheat harvester machine. This model clearly shows the combine harvester main elements. Moreover, it has been sectioned in order to show the functioning principles of the internal parts. This cutaway model is carefully sectioned for training purposes, professionally painted with different colours to better differentiate the various parts, cross-sections, lubricating circuits. Many parts have been chromium-plated and galvanized for a longer life.